Land Rovers are one of the leading 4-wheel drive vehicles available today. They are durable, sturdy, powerful, and are able to handle rough terrain while providing a smooth comfortable ride. When problems arise with your Land Rover it can be disappointing and stressful, but just like every other vehicle they need to be properly cared for in order to ensure the vehicle lasts a long time. One issue that is common with the Land Rover is anti-lock braking system failure. The anti-lock braking system, also known as ABS, is a safety feature that your vehicle uses to help prevent avoidable collisions. The anti-lock braking system’s main purpose is to keep your wheels from locking up when you apply the brakes. This, in turn, provides you with greater stability, control and precision. This system especially comes in handy during quick stops when you are trying to avoid an accident. What Causes Your ABS to Malfunction? There are many things that can cause your anti-lock braking system to malfunction in your Land Rover. Even though the module may fail, you may not notice right away if your brakes are in good shape. If you believe that you have an issue with your anti-lock braking system based on the symptoms below, give us a call. Having a defective system can be dangerous and lead to an accident. Your Land Rover has a sensor connected to the ABS and your vehicle’s computer. This sensor can usually tell when something isn’t right and it will alert you by lighting the ABS warning light on your dashboard. This light is designed to alert you as soon as an issue is detected. This gives you the opportunity to have a trained mechanic diagnose the problem. If the light comes on, it will have an error code that your mechanic can find by running a diagnostic tool. If you notice that your brakes don’t respond, they aren’t responding as they should, or they are locking up, there is probably an issue with your ABS. Call us right away so we can check out your issue before any serious problems arise. 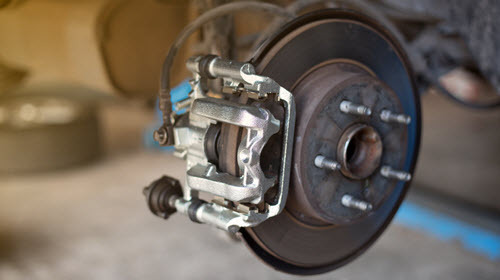 Your braking system should be checked during routine maintenance. It is important to keep on top of your routine maintenance schedule to keep your Land Rover in tip-top shape. This will help improve its longevity and reduce any likelihood of needing major repairs. By keeping your vehicle in excellent condition, your Land Rover will remain much more efficient and will be safer on the road. Preventing ABS system failures is vital in keeping you and your passengers safe. Owning a Land Rover is a luxury, and it means that you may need to put a little extra effort into keeping it in good working condition. It’s important that you hire a certified mechanic that know the ins and outs of the Land Rover. Only a specialist will be able to provide you accurate and efficient repair work. Hiring a generic mechanic could cost you more money in the long run due to the fact they will cut corners, use inferior parts to save money, and they do not possess the knowledge needed to perform proper repairs. You can trust our highly knowledgeable mechanics to take care of all of your Land Rover needs. Dealerships charge high prices and take advantage of their customers. We know that the prices that they charge can be staggering. We will treat you right and will provide you with professional dealership quality services at affordable prices. you are in the Lawndale, Culver City, West Los Angeles, or South Bay, CA areas, give us a call. Here at Import Motorworx, our mechanics are here to help you with all of your Land Rover maintenance. You can reach our South Bay area office on 310-370-2299, or our West LA office on 310-820-8822.